The path that lead me to Insanity . . . On October 21, 2012 I completed my 5th marathon. I blew away my goal time and shocked myself finishing in 4:03; 19 minutes faster than my previous PB. The self gratification of that feat is indescribable. my body transform into it’s most fit state ever. The muscle tone and firm core, that I could not get from running 50 miles a week, was the pot of gold at the end of the rainbow. 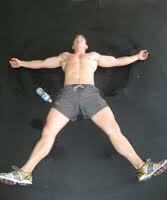 My hubby joined me in P90X and was also ecstatic with his results. He wanted to do it all over again as soon as we finished, but I urged him to try Insanity with me because of the shorter workouts. Day 1 – fitness test. Day 3 – Cardio Power and Resistance. I almost didn’t die during the warm up. Day 4 – Cardio Recovery – Who does this many squats during recovery? This is INSANE! Day 5 – Pure Cardio – This is where the name Insanity comes from. OMG I thought I was in shape. Day 6 – back to Plyo Cardio – The warm up is getting easier.